Ryan Robinson is the newest recipient of the L-3 Communications Fellowship Award from the aerospace department. Ryan briefed the selection committee on his project entitled A Lightweight Battlefield Casualty Extraction Robot. This effort is currently being funded by the US Army TATRC under a Phase 2 SBIR contract with Techno-Sciences Inc.
$25,000/year stipend ($12,500 for the fall semester, and $12,500 for the spring semester) in addition to a half graduate research assistantship. $1,000 for travel (e.g., for conferences to present his research). $4,000 is provided to the faculty advisor for discretionary use. $5,000 is provided to hire an undergraduate researcher in support of the research project. 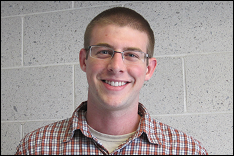 Ryan is currently a master's student in the aerospace graduate program.